I bought these habaneros back when I went to Cameron Highlands with my family in August and it is still bright red and haven't gone bad at all even after being in the fridge for more than 2 months! 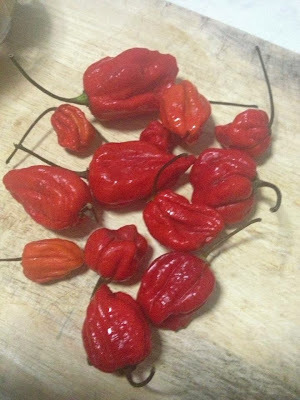 Today I gave a few to my colleagues because they love eating spicy food.Did some research to show them what's a Scoville scale and all..I found out that it wasn't a regular habanero..it's actually the Red Sevina habanero which explains why it is so damn spicy. I only use slivers of them to cook my dishes.Hence why I still have a lot of them.It is superrrr spicy and I dare those who eat super spicy foods and chili padi on a regular basis like me to try this devil of a chili. Back when I came back from Cameron,I used two whole chilies for a huge pot of bolognese..when I was sauteing it with onions..I sneeze nonstop and my nose was so watery.It was really really strong and overpowering! Recently I used it for stir fries and I had to use scissors to thinly cut it..and I used only two slivers from one chili to add a lot of spice to my vegetable stir fry/fried rice. I think it's very expensive in Klang Valley.I've seen in being sold up to rm40 at supermarkets here.But in Cameron it cost only rm5-6 per packet of 10 or more chilies.